If Durham do go onto win the Championship, it will be thanks in no small part to Chris Rushworth, who picked four wickets – including his 50th Division One scalp of the season – to put his county firmly in command on a rain-hit day two against Warwickshire. On a day when rain was playing hide-and-seek with the players and only 43.3 overs were bowled, the hosts made good use of what he described as “perfect conditions for bowling”. Rushworth made it three successive years with at least 50 Championship wickets. At 40-4, the visitors looked as though they might struggle to reach 100 in the first innings for the second-consecutive Championship game, but a 98-run fifth wicket partnership alleviated those fears. Three wickets just before play was eventually called off for bad light meant that it was the hosts who left the field confident of closing the gap on leaders Yorkshire with a win. Rushworth made it three successive years with at least 50 Championship wickets, when he trapped Laurie Evans lbw before lunch. “It’s nice to get milestones, but first and foremost is making sure that Durham are in a position to win the game,” said the 29-year-old. Although only 26 balls were bowled before lunch, Rushworth and Graham Onions made good use of favourable conditions at Chester-le-Street to leave the visitors reeling at 20-3. Warwickshire captain Varun Chopra failed to get to double digits for the fourth successive Championship match and was the first of Rushworth’s three lbw victims. Jonathon Webb and Evans fell in successive deliveries in Rushworth’s next over and Sam Hain only survived the hat-trick ball by flicking it round the corner for four. Ian Westwood fell to John Hastings with the score at 40 before another rain delay forced the players to leave the field before Tim Ambrose could get out to the middle to start his innings. 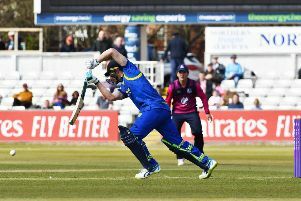 Durham were firmly in control at that point and with favourable bowling conditions, Stoneman’s prediction that they could knock them over “for about 200” looked a real possibility. But Tim Ambrose went on the counter-attack as he got his first 20 runs with five boundaries and the bowlers, according to Rushworth, went “searching for wickets” rather than being patient and started leaking runs. The pair brought up the fifty partnership in 61 balls and Hain, who turns 20 on Thursday, brought up his fourth Championship 50 with a boundary. An outstanding one-handed catch by Keaton Jennings, who was standing at a deepish short leg led to Hain’s demise and Ambrose followed four balls later, lbw to Paul Collingwood. Rushworth picked up Rikki Clarke to become the leading wicket-taker in Division One this season, but was made to wait for his fifth five-fer of the season, as the players went off for the final time at half-past five on a gloomy, wet, stop-start day.